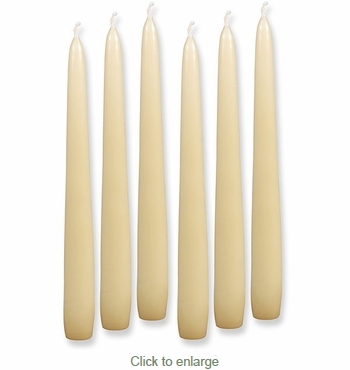 This set of six 8" ivory taper candles are hand crafted with purified parafin wax, for clean burning. All candles come unscented and wrapped. Sold in sets of 6 candles. Use the quantity box for the number of sets of 6 you would like to order. 8" Taper, 7/8" Diameter Base.